In the search for the perfect combination of flours to use for my crust, I paid a rather romantic visit to my local natural foods store and bought myself a 'bouquet'. I spotted soy, oat, hazelnut, almond, buckwheat, and was intrigued to learn flour can also be made from garbanzo bean, millet, teff, potato, tapioca - the list goes on. I bought a bit of each to satisfy my culinary curiosity, and so I'd have a lot to play with once I brought them home. Feeling a little like the first time with a new lover, I sifted and mixed a variety of different flour and starch blends until the mixture seemed happy. With a bit of luck, some heavy breathing, and a lot of butter, the dough came together; happy to spend the night resting in my freezer, cooling off from the afternoon's exertion. For the quiche filling, I scanned the shelves of my neighbourhood greengrocer for inspiration. I picked up a tub of local heirloom tomatoes whose bright colours and bulb-like shapes intrigued me. Slender leeks suggestively bent their green fronds ever so slightly in my direction, so I grabbed those as well. I intentionally sought out the plumpest, firmest cremini mushrooms because in my mind, my mouth, and my kitchen, there is always a good excuse for mushrooms. I like to let the ingredients speak for themselves, and in this case, they quietly ask for just a bit of butter and/or olive oil to gently cook down in, allowing their own inherent flavours to shine. The tomatoes are treated to an olive oil rubdown with minced garlic, salt, and pepper and set to roast in the oven until slightly charred and totally delicious. The leeks are thinly sliced and slowly caramelized in a bit of butter and olive oil on the stove-top, filling the kitchen with their characteristic aroma. The mushrooms are then sautéed in a bit of olive oil, garlic and hot pepper until they get to that really good point where they almost stick to the pan. 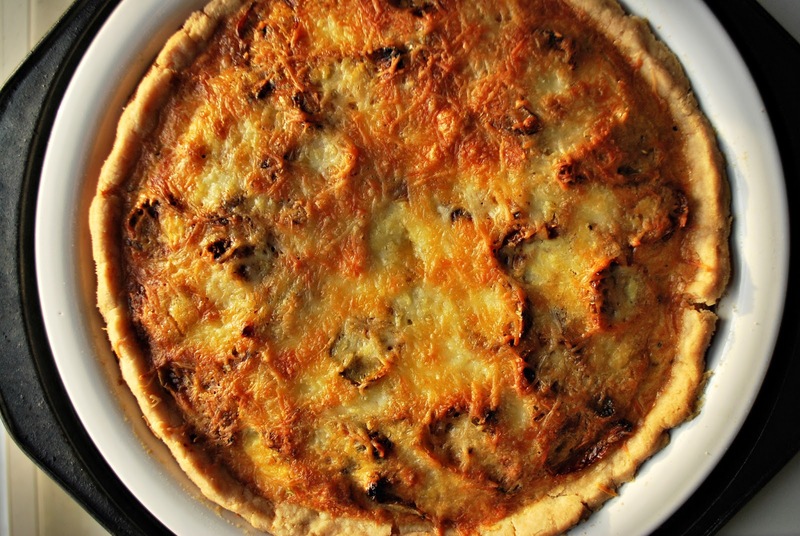 To construct the quiche: the blind-baked crust is deliciously tiled with a layer of mushrooms; sprinkled with the ribbon-y leeks over top; and carefully dotted with the garlicky tomatoes. A mixture of lightly beaten organic eggs and cream (with a touch of nutmeg) is then poured over the layered filling, which finds its way into every crevice. A generous sprinkling of slightly nutty Baby Parmesan cheese seals in the flavour. I enjoyed a piece of this quiche hot from the oven, with an impromptu salad of baby spinach, red pepper, and carrot on the side for some colour and crunch. I also ate slices of this quiche cold from the fridge, which does for quiche what it does so well for leftover pizza - it has that 'morning after' appeal. Apart from a faint nuttiness, and a slightly firmer forkhold, the gluten-free crust is just as tasty and buttery as its glutinous sibling - I would certainly invite it back to my kitchen boudoir for dessert sometime. 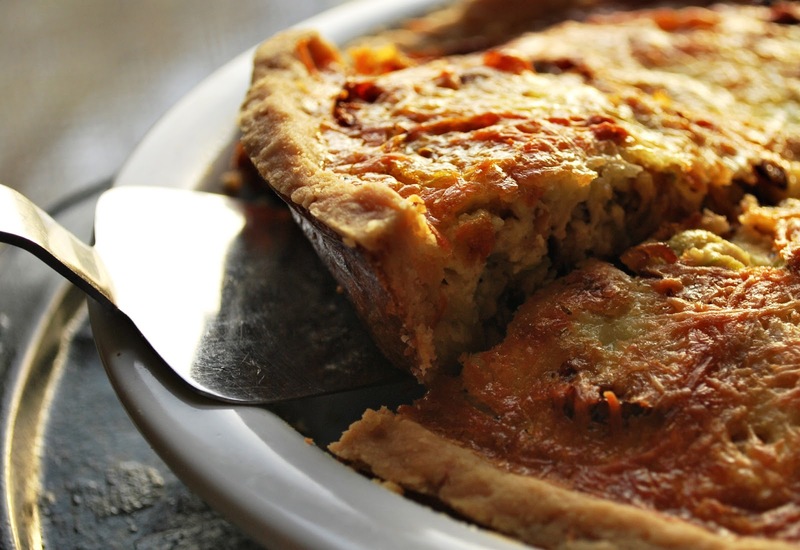 When you are craving something that comforts, nourishes and seduces - this quiche is who you call. Whisk all the above until fully combined. Reserve the extra for rolling out the dough. In a food processor or stand mixer, combine the flour, salt and sugar and pulse to combine. Add the chilled butter, pulsing until the mixture resembles coarse meal and the butter is the size of peas (approx. 8-10 times). With processor/mixer running, add the ice water, a tablespoon at a time, just until the mixture starts to clump, and holds together when pressed. Do not use any more water than necessary. Place the dough in a Ziploc bag and use the sides of the bag to form a disk with the dough. Seal and refrigerate for at least an hour, and up to 3 days. Remove dough from fridge approximately 5 minutes prior to rolling. Place dough onto a floured piece of waxed paper, flour the top of the dough, and place another piece of waxed paper on top. Gently roll out the dough to a circle approximately 12" wide, using your fingers to repair any cracks along the way. Patience is required, as it does not respond as intuitively as a gluten-based pastry dough. 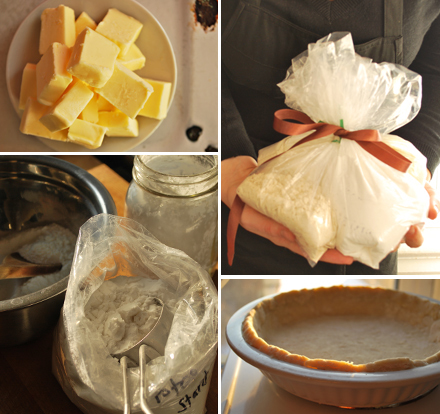 Carefully lift the top layer of waxed paper, and gently drape the dough into a 9" pie/tart pan. Remove the additional waxed paper and press dough down gently onto the pan's surface. Trim the edges of the dough and use the remainder to fill any gaps, pressing or pinching along the sides to form a smooth edge. Place the pie pan in the freezer - freeze for 30 minutes. Remove pie pan from freezer and line with aluminum foil and pie weights (uncooked dry beans or rice works well here) and bake in a 350 F oven for 20 minutes. Remove foil and weights and allow to bake for another 10 minutes, or until a light golden brown, at which point it is partially baked and ready to be filled and baked further. For the tomatoes: combine the tomatoes, 1 clove minced garlic, 2 tablespoons olive oil, salt & pepper in a small bowl. Stir to coat. Lay the tomatoes, cut side up, on a parchment-lined cookie sheet and bake in 350 F oven for about an hour or so, or until a little charred and slightly shriveled. Place in a bowl, set aside. For the leeks: slice the leeks (white part only) thinly, and sautee with 1 tablespoon butter and 1 tablespoon olive oil on medium-low heat, stirring occasionally, until lightly caramelized. Salt to taste. Remove from heat, set aside. For the mushrooms: after removing the stems, thinly slice the mushrooms. Allow two tablespoons of olive oil to heat on medium-low in a large frying pan. Add the remaining minced garlic and the minced canned hot pepper in oil (if using). Let infuse the oil for about a minute, then add the sliced mushrooms, placing a lid right on top of the mushrooms that fits just inside the pan. Occasionally remove the lid and stir. The mushrooms are done when all the liquid has evaporated, and some of the mushrooms turn brown and start sticking to the pan. Season with salt and freshly ground pepper to taste. Remove from heat, set aside. In a large measuring cup, whisk together eggs, cream, nutmeg, and a touch of salt and pepper. Set aside. 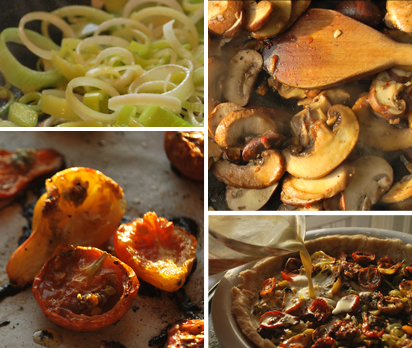 Begin by layering the mushrooms evenly on the bottom of the partially baked crust, followed by sprinkling the leeks, and then placing the tomatoes evenly on top. Carefully pour the egg/cream mixture on top until the liquid comes close to the top of the pastry. Generously cover the surface of the quiche with shredded cheese. Bake at 350 F for 30-40 minutes, or until a knife inserted in the centre comes out clean. I'll have to try your quiche this summer when I'll have heirloom tomatoes from my garden. It sounds terrific. From what I've seen on your blog, your garden sounds amazing. It's so NOT garden weather here in Toronto now - I'm looking forward to snuggling in with a seed catalogue to plan for the spring! Oh. My. Foodness. This looks completely and utterly amazing. Top notch, lady, top notch. I swear reading this recipe is making my mouth water (probably shouldn't be reading food blogs before brunch). 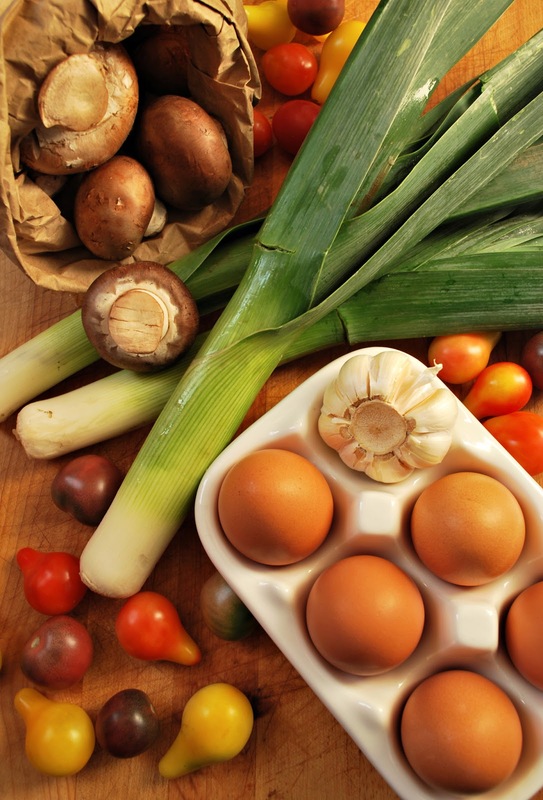 The filling sounds delicious (mushrooms and leeks is one of my favorite combinations) and I love your choice of oat and rice flours for the quiche! I know - I often make the 'mistake' of either blog reading or grocery shopping when I am hungry. Have a great brunch! I love gluten-free goodies, that's for sure! But me, too! I love my gluten-ous French pastries and sweets to stay gluten- or grain-free (I think). Like you, I'm just trying out this Paleo / SCD for a month or so (or as long as I can hold out), and see how it goes. Later on, I can just split the time 80% gluten- and grain-free, then 20% not. Hehe, does that make sense even? Oh, but I know you'll LOVE gluten-free baking. So many flours, so many possibilities, so many liaisons to be had! Ha - yes, it's like 80% married to health, and 20% the mistress of assorted pastries. I am waiting for the perfect morning to grab a freshly baked croissant now that it's February and I am welcoming in small rendezvous with gluten again - it's been my most major craving this past month.